This 5 reel Video slot with 9 paylines has a comical Farmyard theme, where pigs dance and have fun when the other animals on the farm are away. 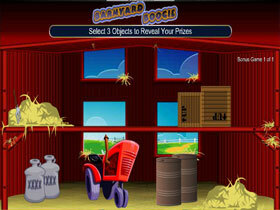 It is a very entertaining slot with funny animations and sound effects. When a player gets 5 Farmer icons showing up on the reels 5 times after each other, he will win the Jackpot. Other icons that will appear on the reels are the Farmer, Tractors, Dancing Pigs, Cows, Milk Canister and High value poker cards. The Wild icon is a Pig wearing sunglasses, which only shows up on the 2nd and 4th reels, and in turn triggers the Bonus round. 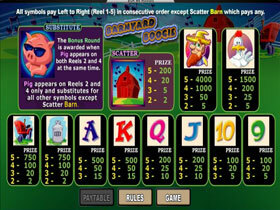 The Scatter icon will multiply a players bet when it shows up across the reels. 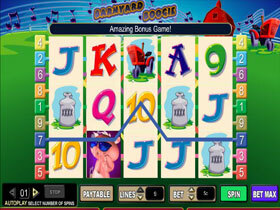 The coin denomination is from as little as 1.00 to 20.00 and the Jackpot is worth 4 000 coins.